Hungry people are angry people. In the makeshift tent camp just meters from Macedonia, here on the Greek side of the border with the rain sleeting down overnight Thursday, refugees expressed deep anger at the conditions they are enduring and fury with a razor-wire fence the Macedonians have erected to block their progress deeper into the promised land of Europe. United Nations officials say at least 10,000 refugees are here – mostly Syrians, with some Iraqis and North Africans among them – and their number is expected to increase by nearly 2,000 a day. Greek officials have warned that this month at least 70,000 refugees will be trapped in Greece, creating a humanitarian crisis for a cash-strapped country struggling with debilitating debt since the 2008 financial crash. The Syrians have come from all over their war-shattered country: from the ancient, half-razed city of Aleppo; Homs, once known as the capital of the Syrian revolution; Palmyra, another ancient town now in the hands of jihadists; Deir ez-Zor; and the Syrian capital, Damascus. They have survived barrel and cluster bombs dropped by a regime that has preferred to wreck a country rather than relinquish power. They have fled the clutches of Islamic State militants. They have endured five years of civil war, navigated minefields to brave illegal crossings into Turkey, dealt with unscrupulous human smugglers and survived perilous Aegean Sea passages in small, overcrowded boats that only the foolhardy or desperate would risk. And now their hoped-for European destinations – Germany, for most – are blocked by the small Balkan country of Macedonia and beyond by border restrictions in Serbia, Croatia, Slovenia on the Balkans route to western Europe. Austria’s leaders now say they will not be the “distribution hub” for Germany, if refugees make it that far. “Where are we meant go? What are we meant do?” asked Abdul, a former olive farmer, whose wife is expecting a third child any day now. 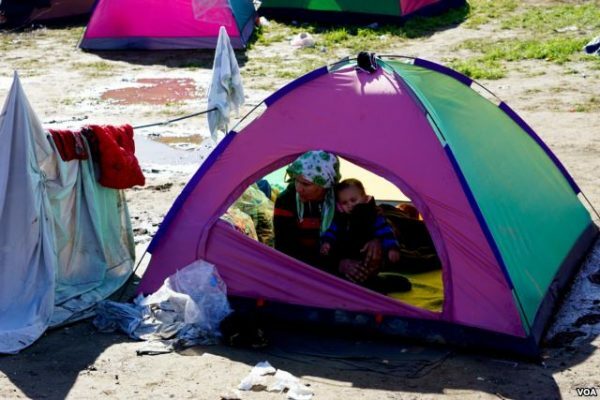 The couple’s 2-year-old daughter and 10-month-old son sleeping fitfully as we talk in a thin tent bought for $16 by their father and erected on the platform of Idomeni’s gloomy railway station. As Abdul vents, the rain intensifies. In the tents lining the platform, a chorus of coughing rises from young and old. Abdul’s parents are in Germany. On his smartphone, he shows me photographs of his family farm and its 1,000 hectares of olive trees on the outskirts of Aleppo. “There is no one there now,” he says sadly. Like most of the Syrians VOA talked with here, into the early hours of Friday, Abdul has given up on Syria. “There is no future there,” he remarks sadly, glancing at his young children. Aleece, sitting with her 6-year-old daughter at an adjacent tent, fled Palmyra several month ago. “Syria is beautiful – or was,” she says. She has ruled out returning there. She and her husband Ahmed, a barber, want to go to Germany with their three young children. She has a brother there. Other relatives are in Raqqa, the de facto capital of Islamic State militants. “We have not talked to them for weeks,” Aleece says. Both families have exhausted their cash. The adults have eaten nothing for two days, the kids very little. All are ill with coughs and flu, but in the morning they will crowd the razor-wire fence and face Macedonian troops armed with tear gas and rubber bullets as well as Slovene and Polish soldiers there to provide support. They will observe the water cannons, Humvees, armored personnel carriers and the dogs, and scream and plead to be allowed to continue their journey. There are no signs that Macedonia’s government will have a change of heart. And to avoid more refugees traveling to northern Greece, authorities here are attempting to stop refugees who have arrived on Aegean islands from Turkey to board ferries to the Greek mainland. Travel agents on the islands of Lesbos and Leros say they have been instructed not to allow the asylum-seekers to buy tickets for public ferries. Ferry companies have been asked to reduce services, partly so that ferries can be used for emergency accommodations. The Greek authorities appear to be trying to slow the refugees from reaching the mainland, while they try desperately to persuade other European Union countries to open their borders and to cope with the challenge collectively. More than 130,000 refugees have arrived in Europe this year alone with 400 drowning at sea, according to the UN’s refugee agency. After meeting Thursday with European Council President Donald Tusk in Athens, Greece’s Prime Minister called for sanctions to be imposed on EU states that refuse to take in their share of the thousands of refugees arriving in his country. Alexis Tsipras also promised to provide dignified living conditions for refugees trapped in Greece. But that promise appeared to be falling far short in Idomeni, where many of the refugees have been for more than a week. 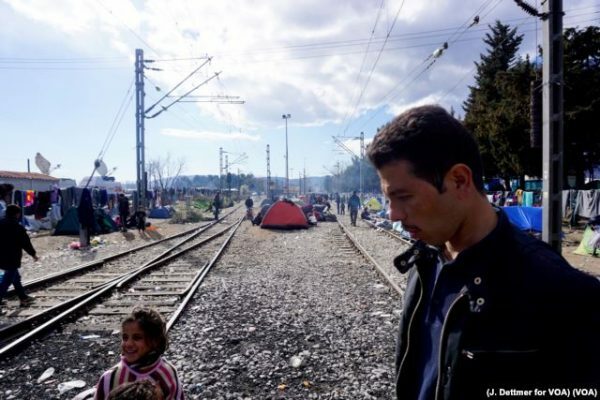 In the sprawling makeshift camp around the railway station, refugees complained of hunger and cold. Outside tents, families tried to keep open-air fires going but they sputtered in the rain. The only warm place was a tea house a hundred meters or so from the railway station. It was crowded with refugees seeking shelter from the rain or electrical outlets to recharge their phones. 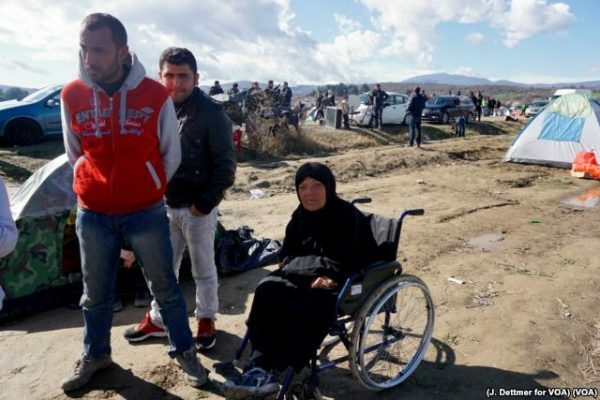 Abdul said no doctors had visited their area of the encampment, and he worries about his wife.